Update: A press release from Gearbox parent company all but confirms that Borderlands 3 will make its way to Steam eventually: "At launch on September 13, Borderlands 3 will be available for PC exclusively through the Epic Games store. 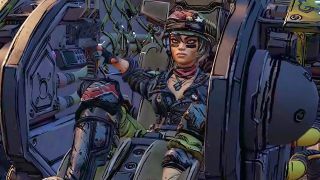 Borderlands 3 will be available on additional PC digital storefronts in April 2020." For those counting, that's six months of exclusivity for Epic Games store. Original story: Borderlands 3 will be coming to the Epic Games Store as confirmed by Gearbox, after the Epic Games Store logo was spotted in the newest trailer. So, after some speculation, we know it's going to be available on the Epic Store, which is likely to rattle players wondering about as yet unconfirmed Steam availability. A number of games have recently dismissed appearing on Steam in favour of Epic's own PC Gaming store. So Borderlands 3 could be joining The Outer Worlds and Metro Exodus in only being on the Epic Games’ Store on PC. If you're planning to play Gearbox's game with a keyboard and mouse you might have to have to set yourself up with an Epic Games Store account. We’ll have to wait and see whether Borderlands 3 eventually comes out on Steam, but until then here’s the hidden details we spotted in our Borderlands 3 trailer breakdown, or look below to see all the secrets we found in the first teaser trailer!